MANCHESTER, England (AP) — Manchester City's pursuit of a quadruple ended on Monday when it was surprisingly eliminated from the FA Cup by losing at third-division Wigan 1-0. Wigan beat City in the 2013 FA Cup final, but this was an even bigger shock. Will Grigg's late goal was enough for the League One side to pull off the upset in the fifth round. They host Southampton in the quarterfinals next month. 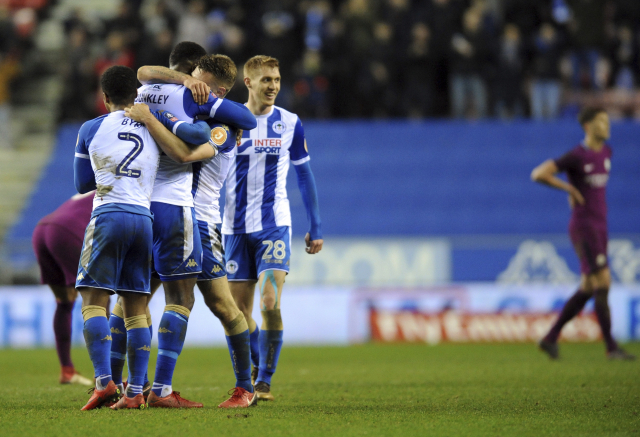 "We had to ride our luck with a couple of flashing crosses, but that's what makes the FA Cup so special," Wigan manager Paul Cook said. "Our lads deserve a lot of credit for the amount of work and the level of energy they put in. To beat a Man City team you have to do that." City was forced to play the entire second half with 10 men after left back Fabian Delph was red-carded on the stroke of halftime for a strong challenge on Max Power. City manager Pep Guardiola accepted the referee's decision and played down its significance. "We played good in the second half even with 10 so the influence in terms of the way we played wasn't too much," he said. "Of course, with 11 it's easier. We conceded one shot on target in 90 minutes and we lost. Football is like this. "Of course, we are sad and we want to go through because the FA Cup is a nice competition and you want to go to the quarterfinals. They score a goal, we were not able to. We congratulate Wigan for their victory." While Delph's red card led to Guardiola and Cook exchanging strong words on the touchline and in the tunnel at halftime, both managers said there wasn't a problem. "From our point of view we're trying to get every edge in everything we can," Cook said. "We certainly wish them well fighting on all fronts because they represent English football so well." City enjoyed 83 percent of possession and 29 shots to Wigan's four, but could not take advantage. Sergio Aguero headed over early on and Ilkay Gundogan forced a good save from Christian Walton before miskicking from another good position. Aguero looked like opening the scoring after breaking into the box just before the interval, but Walton produced another fine save. Controversy then erupted when referee Anthony Taylor dismissed Delph following a sliding challenge on Power. Taylor initially had a yellow card in his hand, but eventually brandished the red one, sparking vociferous complaints from City players, who felt the decision was harsh. Guardiola was also angered and encroached on to the field, his arguments with Cook continuing for some time afterwards. City was further frustrated after the break and Grigg capitalized on a Kyle Walker error to win it for Wigan 11 minutes from time. The Northern Ireland international seized possession on halfway and charged upfield before slotting a fine shot past Bravo from the edge of the area. Wigan survived a nervy finish, with the final whistle prompting a pitch invasion. Television pictures appeared to show a home supporter and Aguero involved in a physical exchange. Aguero appeared to strike the supporter after the latter said something to the forward, who had to be held back by his City teammates. Guardiola and Cook said they did not see the post-match incidents because they were in the changing rooms.